Adad Hannah, the internationally acclaimed Canadian artist, came to SAMA in January looking for inspiration. Known for photographic and video works using or inspired by objects in museum collections, Hannah was here to select something in the Museum’s collection as the basis for a new project. I hosted the artist as we met with all the department curators to tour the collections. By the end of the visit, Hannah and I were both in agreement that we could easily imagine narratives taking place in the scholar’s library and bedroom located in the Lenora and Walter F. Brown Asian Art Wing. Since the actual rooms and the objects they house are much too delicate to be used as stage sets, the Museum staff worked with Hannah to create a new set as a hybrid variant of the rooms. We temporarily deinstalled a section of the Contemporary Galleries as the location for the production. To make the setting more complex and at the same time playful, Hannah decided to incorporate objects from other cultures, such as the Irish silver from the fourth floor mezzanine of the Museum’s East Tower. In preparation for Hannah’s return visit to produce the new work, I lined up a corps of twelve volunteer models, most of them local artists, a set designer, a seamstress, and a hair-and-makeup artist. Local photographer Ansen Seale, whose work is included in the SAMA collection, signed on as Hannah’s photography assistant. When Hannah arrived in mid-April for production, we worked with John Johnston, the Coates-Cowden-Brown Curator of Asian Art, and the registrars and installation crew to gather objects from Museum storage, as well as from local private collections, to be used on the set. 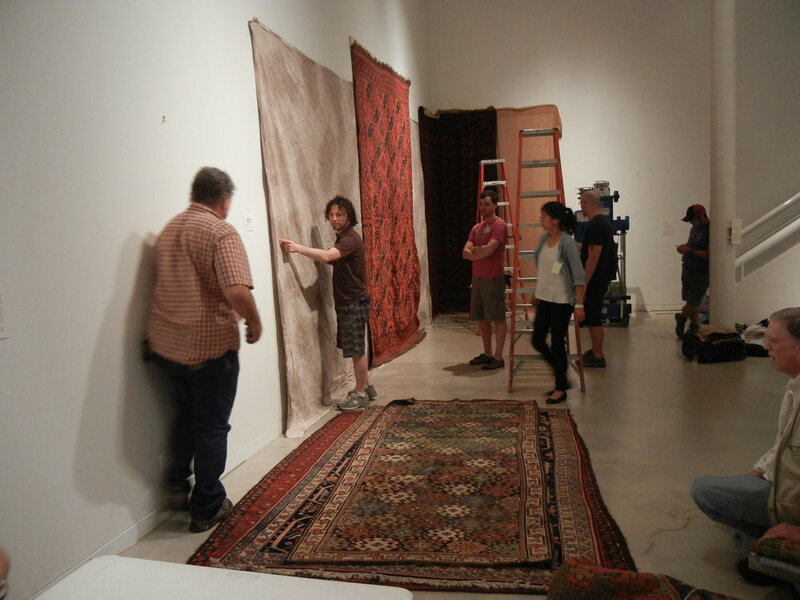 We borrowed oriental rugs from two local dealers in the genre for the backdrop and flooring. Hannah also ordered colorful fabrics from Japan and had these shipped to the Museum, where the seamstress turned them into costumes. The entire production of Hannah’s latest project, Daydreams of the Drunken Scholar, took place over the course of a week, with two days devoted to gathering objects, three days for set construction, and the final two days for photographing and videotaping. Two of the videos and four of the photographs are included in Adad Hannah: Intimate Encounters, an exhibition on view in the Focus Gallery from September 1 – December 30, 2012. 2012, Adad Hannah: Intimate Encounters, San Antonio Museum of Art, Texas.